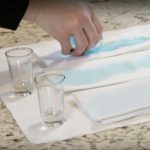 In this series, SimuLinen premium napkins visually shows how to fold napkins in a variety of ways. Learn how to fold paper napkins in the Gala Fold, Standing Fan, Elegance Style and a whole lot more napkin folding videos. Enjoy!